With so many children's dvds this time of year geared towards Christmas when I got the first two dvds in the Shalom Sesame dvd series in the mail was a bit of a surprise and a bit of a novelty. We are not Jewish and I have to admit that I really honestly know very little about the Jewish religion but I think learning more with the help of Grover along with Connor and Dylan sounds like fun!! 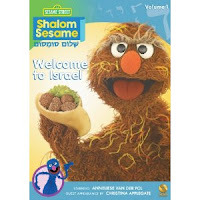 Shalom Sesame - Welcome to Israel - is the first dvd in the series and it's all about Israel. Grover takes viewers with him on his trip to Israel and along with his new friend Anneliese van der Pol they explore Israel. You learn about Jewish holidays, culture, and some of the traditions. Shalom Sesame - Chanukah : The Missing Menorah - is the second dvd in the series and thus far my favorite! Grover sets out to help Anneliese find her missing menorah before Chanukah begins!! It's a great introduction to Chanukah for non Jewish children, and a fabulous dvd to add to your collection for the holiday season! My only complaint about the dvds is they are very short. Lasting a little less than 30 minutes each I think they could have added more extras or combined some of the dvds in the series into one. Otherwise it's a great series and a great edition to our Sesame Street dvd collection! You can buy your own copy of Shalom Sesame - Welcome to Israel and Shalom Sesame - Chanukah : The Missing Menorah on dvd right now on Amazon ! Disclosure: We were given a copy of Shalom Sesame - Welcome to Israel and Shalom Sesame - Chanukah : The Missing Menorah free of charge, we were not compensated for this post in any other way. My opinions and comments on items we review are always my own and are never influenced by sponsors.